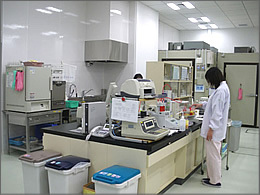 Bussan Food Materials Co., Ltd., is a company that manufactures and distributes processed fruits, juices, and syrups. 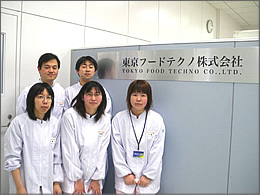 Their products are used for production of juices, ice creams, jellies, yogurt, candies, dressings, and sauces. These products are shipped out according to vendors' needs. 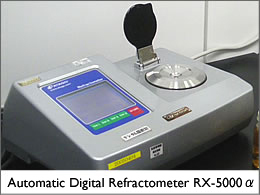 RX-5000a Digital Refractometer for quality control. 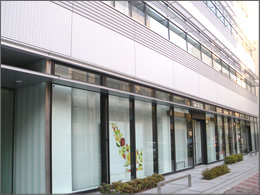 Their office location is about a 5 minute-walk from the JR Asakusabashi station or Bakurocho station, and Toei Line Asakusabashi Station. They moved to this nice new office location in August 2010. Our staff visited the technological development center located on the first floor. Would you tell us about your line of business? At our technological development center, we strive to support production of high-quality products by using our longstanding technology towards product development, material receiving inspection, and product inspection. 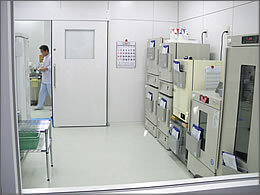 Once you enter, you will see that many of their labs are walled with large windows. 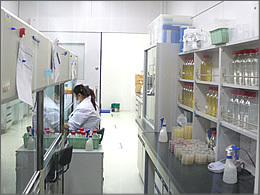 Their technological development center was based on the concept of "Transparent Laboratory," and from the hallway employees and guests are able to observe the work being done in the laboratory. This is their microbe lab. 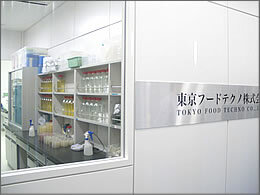 This is their physical and chemical research lab. They carry three each of the same instruments, and they are strategically situated so that measurements can be taken in sequence three at a time. Our RX-5000a is also placed in three stations. What are the inspection components for quality control? They include, but are not limited to, Brix (sugar content), acidity, pH, color, sensory evaluation, foreign materials inspection, and bacteriological testing. What do you emphasize during quality control? We strive to maintain fast and reliable service to provide our customers with safe and unfailing products. We set high operation standards and check our inspection apparatus so that we can always maintain exceptional precision. 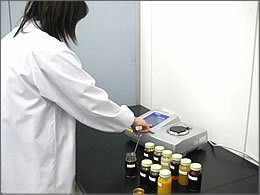 Also, we work to improve our product quality by regularly training employees for sensory evaluation. How do you inspect and calibrate our refractometers? Before each usage we calibrate the refractometers with distilled water, and we also do a monthly calibration with 40% and 60% standard sucrose solutions to confirm on its accuracy. On top of that, we send our units to a 3rd party lab for annual calibration. Also, to increase the consistency of measurements taken at this lab and the labs at other production facilities, we use the same RX-5000 series to measure the same samples. How user-friendly is the RX-5000a? I have always been using ATAGO's refractometers since I started working here. 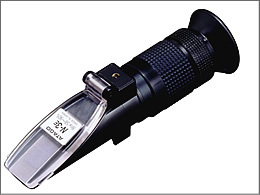 The first model that I used was an Abbe refractometer. Depending on the color of fruit juice, sometimes I had difficulties reading the scale due to it being too dark, but improvement was made quickly. From the original Palette type, it was improved into more accurate RX-5000, and now we use the RX-5000a. The RX-5000a is easy to use, and I feel it is what an ideal Brix measuring devise would be. 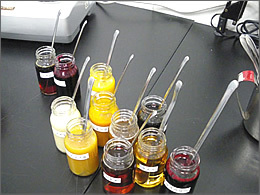 At the QC lab, we collect fruit juice with a spatula and place it on the sample stage of the RX-5000a, taking measurements one after another. 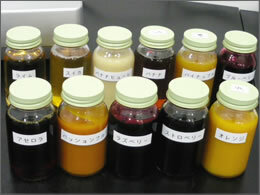 Though the samples are all fruit juices, there are some that are murky while others are clear with no pulp. Also, there are many different types of clear juices, such as those with darker tint and those that are completely transparent. Translucent juices are used to clear-coat products, such as candies. We had an opportunity to taste some of the juices. It was hard to judge the slight differences in flavors. Also, for sour juices, its taste was too strong for me to judge flavors by a taste test. Tasting their juice samples reminded me of flavors of all the different candies and snacks that I have had, and made me realize how widely their products are used. 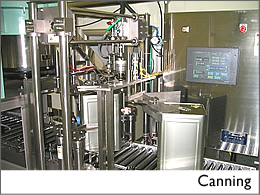 Please tell us about the manufacturing process of your factory's juice products. There are many steps to our manufacturing process, such as material receiving, defrosting, blending, sterilization, UF filtration, concentration, packaging; I will give you an overview of these processes. First we must carry in the raw materials. We procure raw materials in its best condition; to maintain its quality, we manage the temperature conditions to be appropriate for each product. 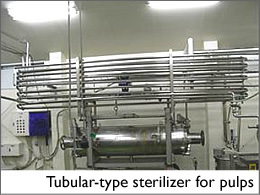 After preparation, products are boiled down or go through Ultrafiltration (UF). During the heat concentration stage, we use the N-2E, N-3E Hand-held Refractometers to frequently check its Brix values. In order to preserve the natural taste of fruits, heating is performed swiftly. 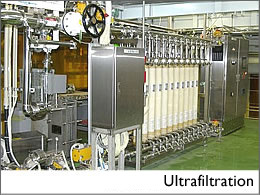 Upon requests from customers, some of our products go through Ultrafiltration (UF). This process removes any insoluble solids that cause turbidity or sedimentation through membrane filtration. The size of the filter is a molecular weight cut-off (MWCO) of 6,000, which filters out most insoluble solids, producing high-quality clear juice concentrates. 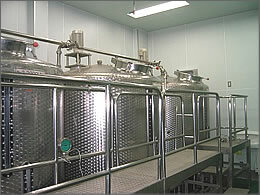 Processed juices go in tanks, and every single tank is tested for quality. 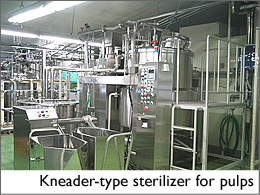 Only those that meet our QC standard can go on to the next stage, sterilization. 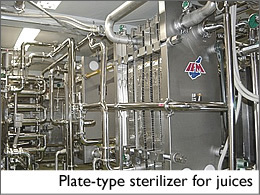 For sterilization, we use plate-type for juices and kneader-type and tubular-type for pulps. Next is the packaging process. 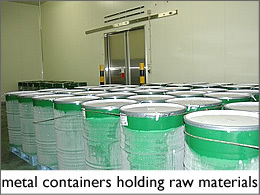 Here, the processed goods are filled into cans, sacks, or boxes to be shipped. Different types of packaging are used according to our customers' needs. We store products at the most appropriate temperature for each product, but most are stored frozen to preserve the flavor. Doing business with fruits must be hard since it's affected so much by weather. When we are obtaining raw materials, we always take into consideration the weather patterns and harvest seasons of the northern and southern hemispheres. We import from all over the world, and we perform inspections at production sites to maintain quality of all the ingredients. Please tell us what makes your company special. Our company motto is "Everything Processed Fruits," and we pride ourselves in the wide variety fruits and processing methods we make available. From small batches to unique orders, we can always tailor our products according to customers' needs. We are working on perfecting our fit-to-need services from development to shipment to thoroughly support our customers. Mr. Hosono, Mr. Haeno, and everyone in production control, thank you so much for kindly answering all of our questions.